Jan 25, 2017: My Internet became so slow all of a sudden. Please help! Feb 10, 2017: Only fast speeds when "forced"? Mar 01, 2017: Does it matter what kind of modem I get? Mar 16, 2017: Need help finding the best modem and router! Mar 16, 2017: Need help finding the best modem router! Jul 21, 2017: Which modem do I purchase? Jul 26, 2017: Can I not use my SB6141 modem with my new Extreme 150 plan? Jul 29, 2017: [WiFi] My up/down speed is amazing but my page-load and streaming/buffering speeds are terrible. Please help. Oct 01, 2017: WOW Internet. 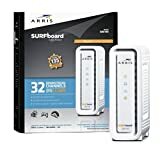 Recommended Modem and Router (or combo) for 110mbps? Oct 16, 2017: I need help choosing a cable modem and router. May 28, 2018: Cox regular Wi-Fi modem compared to their Panoramic modem? May 28, 2018: New to Comcast, what modem should I get? Jun 06, 2018: Xfinity modem - been paying 11 dollars a month to rent it. Is it better to just buy one? If so, any recommendations? Nov 06, 2018: Should I buy an AP instead of a typically everything in 1 router? Apr 02, 2019: Best router?